You can find the Python Jupyter Notebook used in this exercise here. These Python (3.6) scripts walk through the creation of a database and standby server. The reason I've done this rather than just take the default configuration is that this approach gives me a lot more control over the build and enables me to change specifc steps. If you are just wanting to get the Oracle Database running inside of Docker I strongly suggest that you use the docker files and guides in the Oracle Github repository. The approach documented below is very much for someone who is interested in a high level of control over the various steps in the installation and configuration of the Oracle Database. This current version is build on top of Oracle's Internal GiaaS docker image but will be extended to support the public dockers images as well. It aims to build an Active Data Guard model with maximum performance but can be trivially changed to support any of the required models. It uses a mix of calls to the Docker Python API and Calls direct to the databases via cx_Oracle. The following code section imports the needed modules to setup up our Docker container to create the Oracle Database. After that we get a Docker client handle which enables use to call the API against our local Docker environment. The following section contains the parameters for setting the configuration of the install. The following parameters image_name,host_oradata,sb_host_oradata need to be changed, although sb_host_oradata is only important if you are planning on installing a standby database. This code does the heavy lifting. It creates a container oracleprimary (unless you changed the paramter) running the Oracle Database. The containers 1521 port is mapped onto the the hosts 1521 port. This means that to connect from the host, via a tool like sqlplus, all you'd need to do is sqlplus soe/soe@//locahost/soe. The next step uses DBCA and configures features like Automatic Memory Mangement, Oracle Managed Files and sets the size of the SGA and redo logs. It prints out the status of the creation during it's progression. NOTE : This step typically takes 10 to 12 minutes. [WARNING] [DBT-06208] The 'PDBADMIN' password entered does not conform to the Oracle recommended standards. This step creates the database listener for the primary database. The tnsnames.ora will be over written in a later step if you choose to have a stand by configuration. NOTE : I could create a DNSMasq container or something similar and add container networking details to make the whole inter node communication simpler but it's a bit of an overkill and so we'll use IP addresses which are easily found. Copyright (c) 1991, 2018, Oracle. All rights reserved. Service "ORCL_DGMGRL" has 1 instance(s). At this stage you should have a fully functioning Oracle Database. In theory there's no need to go any further if thats all you want. This step creates another container to run the standby databases. It should be pretty much instant. NOTE : You'll only need to run the rest of the code from here if you need a standby database. Create some additional directories on the standby so they are consistent with the primary. Create the standby listenrs network configuration and then start the listener. NOTE : We'll be overwriting the primary databases tnsnames.ora file in this step. Service "ORCL_STBY_DGMGRL" has 1 instance(s). The next step is to connect to primary and standby servers and set various parameters and configuration to enable us to run Data Guard. First check the status of archive logging on the primary. Duplicate the primary to the standby. For some reason the tnsnames isn't picked up on the primary/standby in the same location so an explicit connection string is needed. It's best practice to use Data Guard Broker and so we'll need to start it on both instances and then create a configuration. Configuration "orcl_stby_config" created with primary database "orcl"
We now need to start the standby so it begins applying redo to keep it consistent with the primary. We now have a primary and standby database that we can begin testing with. At this point you should have a physical standby database that is running in maximum performance mode. This might be enough for the testing you want to carry out but there's a number of possible changes that you might want to consider. I'll cover these in the following sections but they "icing on the cake" rather than required. As before we'll use the Database Guard Broker command line tool to make the change. We'll use Database Guard Broker to change us back to asynchronus mode. On Oracle Database 19c we can also enable DML redirect from the standby to the primary. I'll add this on the release of the Oracle Database 19c software for on premises. The following notebook goes through the process of building an Oracle Docker image of the Oracle Database. If you are just wanting to get the Oracle Database running inside of Docker I strongly suggest that you use the docker files and guides in the Oracle Github repository. The approach documented below is very much for someone who is interested in a high level of control over the various steps in the installation and configuration of the Oracle Database or simply to understand how the various teps work. The process documented below uses a Jupyter Notebook (iPython). The reason I use this approach and not straight python is that it's easy to change and is self documenting. It only takes a few minutes to set up the environment. I've included a requirements file which makes it very simple to install the needed Python libraries. I go through the process of setting up a Jupyter environment for Mac and Linux here. Typically the only modification that the user will need to do is to modifythe values in the "Parameters" section. The code can then be run by pressing "Command SHIFT" on a Mac or "Ctrl Shift" on Windows. Or by pressing the "Play" icon in the tool bar. It is also possible to run all of the cells automatically, you can do this from "Run" menu item. host_install_dir = '/Users/dgiles/Downloads/oracle18_software' # The directory on the host where the downloaded Oracle Database zip file is. The first step in creating a usable image is to create a docker file. This details what the docker container will be based on and what needs to be installed. It will use the parameters defined above. It does require network connectivity for this to work as docker will pull down the required images and RPMs. And now we can create the image. The period of time for this operation to complete will depend on what docker images have already been downloaded/cached and your network speed. Once the image has been created we can start a container based on it. And then created the needed directory structure within it. We now need to unzip the Oracle software which should be located in the host_install_dir variable. This is unzipped within the container not the host. NOTE: I don't stream the output because it's realtively large. It should take 2-5 minutes. The next step is to create an Oracle Installer response file to reflect the paremeters we've defined. We're only going to perform a software only install. Now we can run the Oracle Installer in silent mode with a response file we've just created. [WARNING] [INS-32055] The Central Inventory is located in the Oracle base. ACTION: Oracle recommends placing this Central Inventory in a location outside the Oracle base directory. [WARNING] [INS-13013] Target environment does not meet some mandatory requirements. ACTION: Identify the list of failed prerequisite checks from the log: /tmp/InstallActions2019-03-19_02-40-31PM/installActions2019-03-19_02-40-31PM.log. Then either from the log file or from installation manual find the appropriate configuration to meet the prerequisites and fix it manually. Changing groupname of /u01/app/oracle/oraInventory to dba. And finally we can commit the container creating an image for future use. The following code is included to enable you to quickly drop the container and potentially the immage. The first discusses what Jupyter Notebooks are and the second describes the installation of the environment I use. There should be two or three more to follow. 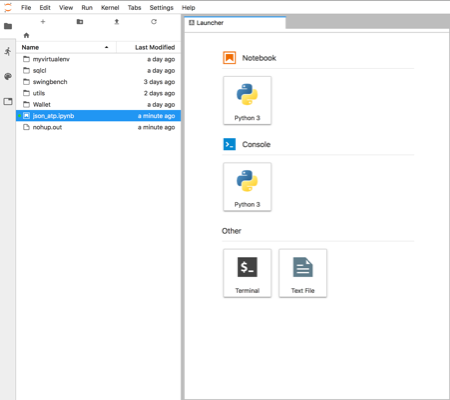 This workbook is divided into two sections the first is a quick guide to setting up Jupyter Lab (Python Notebooks) such that it can connect to a database running inside of OCI, in this case an ATP instance. The second section uses the JSON python driver to connect to the database to run a few tests. This notebook is largely a reminder to myself on how to set this up but hopefully it will be useful to others. Once you've created the server You'll need to logon to the server with the details found on the compute instances home screen. 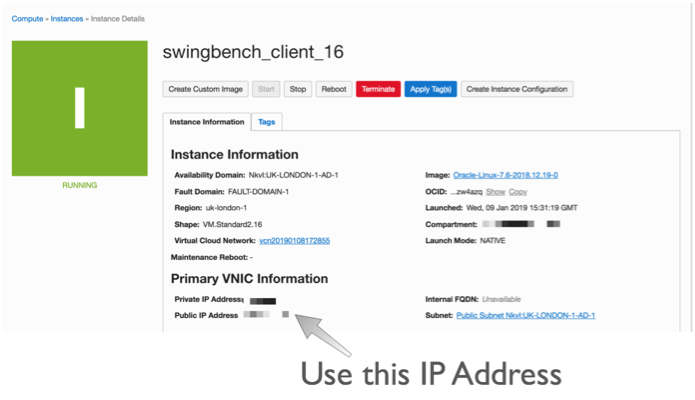 You just need to grab it's IP address to enable you to logon over ssh. This will install python and enable a virtual environment for use (our own Python sand pit). You can make sure that python is installed by simply typing python3.6 ie. Make sure you type quit() to leave the REPL environment. This will install all of the need python modules for the next step which is to start up Jupyter Lab. Jupyter Lab is an interactive web based application that enables you do interactively run code and document the process at the same time. This blog is written in it and the code below can be run once your environment is set up. Vists the website to see more details. To start jupyer lab we run the following command. You can now start creating your own notebooks or load this one found here. I'd visit the website to familiarise yourself on how the notebooks work. This section will walk through using The SODA API with Python from within the Jupyter-lab envionment we set up in the previous section. The SODA API is a simple object API that enables developers persist and retrieve JSON documents held inside of the Oracle Database. SODA drivers are available for Java, C, REST, Node and Python. We now need to set the location of the directory containing the wallet to enable us to connect to the ATP instance. Once we've done that we can connect to the Oracle ATP instance and get a SODA object to enable us to work with JSON documents. NOTE : I'm using the module keyring to hide the password for my database. You should replace this call with the password for your user. We now need to create JSON collection and if needed add any additional indexes which might accelerate data access. To fetch documents we could use SQL or Query By Example (QBE) as shown below. You can find further details on QBE here. In this example there should just be a single document. NOTE: I'm simply using pandas DataFrame to render the retrieved data but it does highlight how simple it is to use the framework for additional analysis at a later stage. To update records we can use the replaceOne method. And finally we can drop the collection.